Hello again, and Happy Thanksgiving! As I mentioned before we just wrapped up the big festival season in Nepal and had a wonderful Diwali (Tihar in Nepal) with the kids. I think it’s one of my favorite holidays – second to Christmas perhaps? The holiday was full of singing and dancing, we had a blast. The kids broke up into groups, and went “Trick or Treating” from house to house for four consecutive days. When they arrived at a house, they sang and dance in return for money…Think Trick or Treat meets Christmas caroling you will have a pretty good idea of what goes on during Tihar. In addition to our group going out into the neighborhood a good deal of groups came to the house. Some of the older groups brought big speaker systems, and had the most amazing dance moves. Pretty much every time a good group showed up, an impromptu dance party erupted amongst the kids, staff, and fellows. One group was so good, that we actually ventured out with them to another house to keep the party going. To cap things off Calicot (a region of Nepal where lots of kids and staff come from) sensation Cheena visited the house. This was most definitely the highlight of the week for the aunties and uncles, and we learned afterwards that this singer was famous in their region of Nepal. 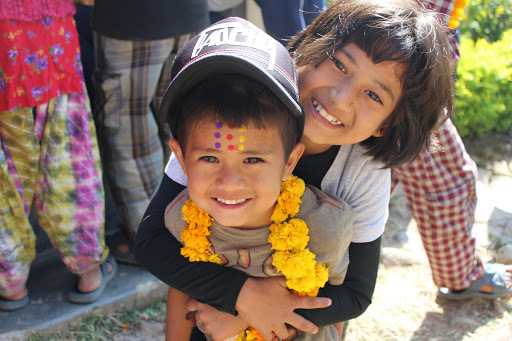 In addition to the singing and dancing Tihar is also the brother sister holiday, in which the sister bless the brother and put tikka on their forehead. In response the boy gives the girl some money. The fellows were blessed by one of my favorite Staff members Amrika! Since the end of Tihar things have begun to get back to usual around the house with school starting on Tuesday. I’m working with a new schedule now which I’m enjoying immensely. Over the first few days I’ve been waking up at 630 and going for a pre-school run. Following the run, I will make a cup of coffee, I learned there is a French press at the house and the introduction of a cup in the morning has been a comforting addition. One of my favorite parts of the day is enjoying an early morning cup of coffee, especially since it’s been getting increasingly cold here in Birendranagar. After the morning routine, I’ve been making my way over to school and working with Lalit the computer teacher with his lessons. Many of the kids have never been exposed to a computer, so I volunteered to help out with classes. The first day was a bit hectic, as some of the younger classes didn’t even know how to turn the computer on; however, things have started ease up a bit. For the first few weeks of class, we’re teaching the kids how to type, which has been much easier for some than others. Additionally, we’re using Mac’s that were donated from the United States, the problem is the curriculum was designed for PC’s and the teacher is well versed with PC’s rather than Mac’s. Fortunately, I’ve been exposed to Mac’s (despite being a PC person), and we’ve made a good bit of progress working with the kids on the donated computers. After classes, I’ve been working with the kids after school in preparation for the Extra-Curricular Championship. In addition to the sporting events, we’re factoring in a Kopila Quiz Competition, Poetry Reading, and a variety of other activities. We’re only a few days’ back into the sports, and I will provide a bigger update in my next post. Beyond, the regular sports, we’ve selected 4 kids for the National Badminton Tournament. Our 4 selectees continue to improve daily, and I’m very excited for the competition. Just the other day, we had to take the kids to the sneaker store as they were playing barefoot. It’s been a rough transition for many of them, and 2 of the girls still prefer playing barefoot to wearing their sneakers. I’m crossing my fingers that they continue to warm up to their shoes. On one last Thanksgiving note…We’re having a big meal tonight to celebrate. The plan is to eat a Turkey, prepare some mashed potatoes, cranberry sauce, and stuffing. As you might suspect we have to get creative in order to make some of those items, however, I think everyone is very excited. Well, I miss everyone back at home a great deal, and am very thankful to have such a wonderful family, and friends. I continued to have an amazing experience in Nepal, and grow a little bit every day, but I think of everyone constantly and look forward to seeing you all soon!